Hello Kitty is a popular character from Japan particularly from the company called Sanrio. This cute character is known as the animal that has a bow in the left ear. Hello Kitty is one of the fictional characters that love by children especially girls. No wonder, there are so many cute things that you may see in the store that has a shape or picture of this character since everyone loves it. There are also people who obsessed with this fictional character, they would get any of the stuff that related to Hello Kitty. If you are one of that person and consider to have your dream bedroom, you may love to see these ideas of Hello Kitty bedroom to inspire you! Take a look at the list below. If you are a parent of 3 little daughters that love Hello Kitty, you may want to get this pretty all pink bedroom for your children. The cutest way to have decoration on the wall uses the custom headboard or just the decoration for the shelves in the back of the bed. All you need is the circle shaped with a bow on the side, it already represents that it is a symbol of Hello Kitty. Well, Hello Kitty theme does not have to be pink all the time right? If you are a teenager or adult you may also love this design for your own bedroom. This design still makes you looks mature but glamour and adorable at the same time. If the colour of pink is too girly for you, the red colour may suitable for you! The original Hello Kitty’s bow is red so it is definitely related to Hello Kitty. This bedroom is suitable for teen or adult. If you already have a red bed, you can decorate it with bedding sets of Hello Kitty. 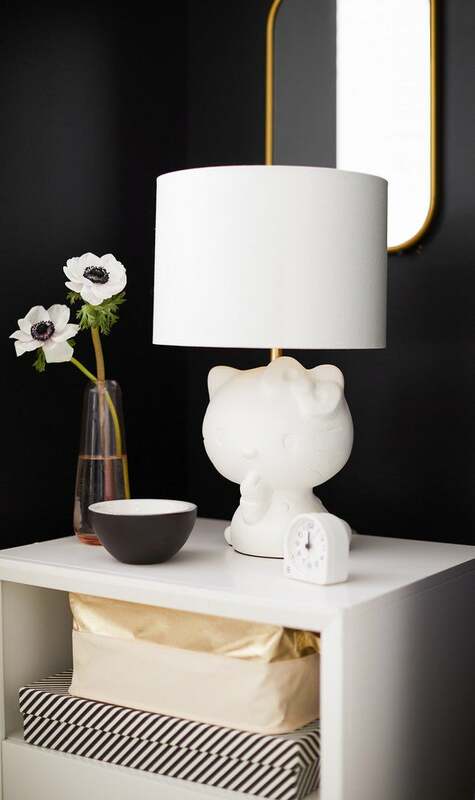 Also, get the Hello Kitty table lamps on your side table to get the theme. Some girls love the purple colour and love Hello Kitty at the same time. Well, this design works for you who love both of them! If your bedroom has a purple colour and purple curtain, all you need is to get Hello Kitty decoration like a picture frame of Hello Kitty, sleeping lamp, and bedding sets. That’s it, you have your own purple Hello Kitty bedroom! 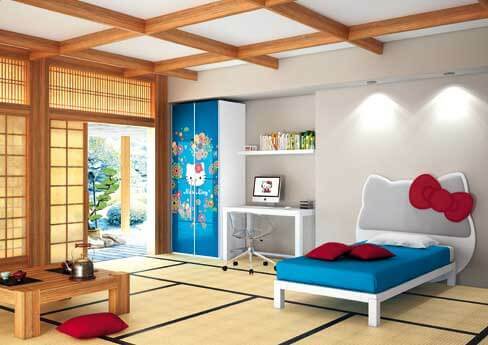 Japanese style is very comfortable and cosy, they mostly use woods and sliding door for their room. If you love Japanese house style and also love Hello Kitty you may love this design! This Hello Kitty is also in a blue colour, another way to have non-girly colour for your bedroom. In this part is the inspiration for you to decorate your bedroom with Hello Kitty theme! Bedding set is the key to make your Hello Kitty theme looks so much better. You do not have to get a pink bedding set if you do not like it, the Hello Kitty bedding set with a fun pattern like this definitely brings the mood! If you have a window in your bedroom, you may need this adorable Hello Kitty curtain. 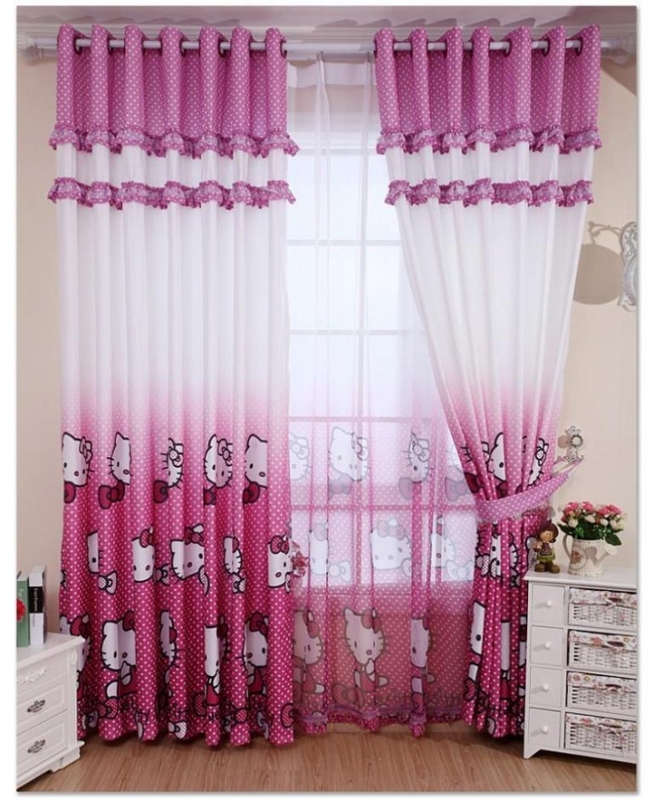 It is adorable because it is not like the plain curtain, it has Hello Kitty pattern and colour gradation. This white Hello Kitty table lamp is suitable for every theme colour of your bedroom. This lamp table has a Hello Kitty shape which is very adorable! If you have a small bedroom, you may want to have a bean bag for your sitting area in the bedroom. This bean bag is very comfortable and movable! You can always found this kind of bed in the online store. In the girl’s bedroom, there is usually a table and mirror for makeup area. This mirror Hello Kitty is suitable for your theme room. It is actually not easy to find furniture like this, tips for you to get it is by custom or buy it online. The throw pillow is necessary to decorate your bedroom, it changes the atmosphere of the whole bedroom! This black throw pillow is actually really cute to combine with other colours. This pillow also looks very simple looks, it is definitely suitable to achieve a modern look in your bedroom. The plain wall is kind of boring to look at. 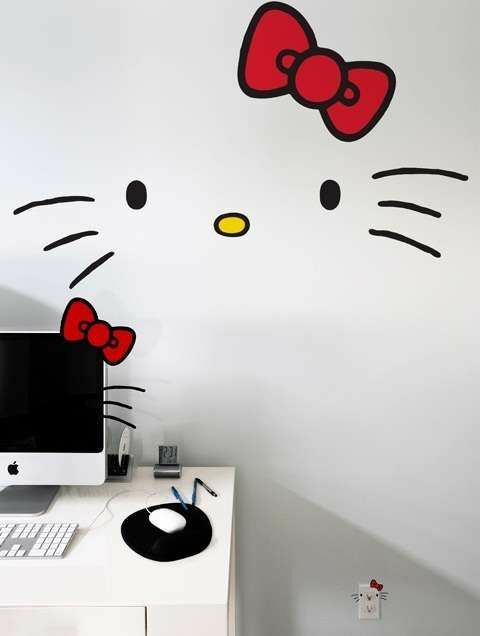 You do not have to buy wallpaper to get Hello Kitty theme, all you need is a big sticker of Hello Kitty for your plain wall. This sticker wall is just cheaper than the wallpaper and also very easy to apply on the wall, just like the ordinary sticker! Dresser is one of the essential things to have in the bedroom. This cute small dresser can also be turned into a side table next to your bed! This dresser is very simple yet very cute with the Hello Kitty knob in the centre. 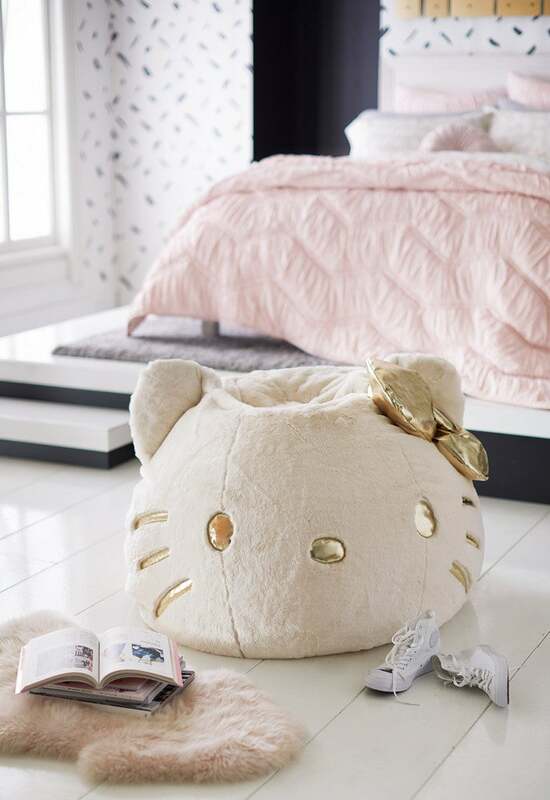 If you have a spacious bedroom, you can also have a small sofa in your Hello Kitty bedroom. This sofa is useful for you to relax after your long day also it can be used as a sitting area with your friends. This simple sofa is really cute for your simple Hello Kitty looks. Doormat can be very important for your bedroom decoration. This really cute Hello Kitty and other characters are the definitions of cuteness. You may also get the polka dot Hello Kitty shaped doormat to add some pattern to your lovely bedroom!